Islamist aggression heats up in Kosovo. Note: This article is accompanied by an attached photo of the latest victim of a Wahhabi physical attack in Kosova, imam and librarian Ejup Krasniqi. We regret the poor quality of the image. Extremist rhetoric and violence by Wahhabi Islamists continues to rock the Kosova Republic. As described a month ago here, the Balkan territory, with an overwhelming Muslim majority, has experienced a sudden campaign of propaganda and physical assaults against Islamic moderates. Wahhabi bombast in mosque preaching now encompasses grotesque and vulgar anti-Christian insults. Near the end of February, Kosovar media reported that Shefqet Krasniqi, the most prominent and provocative local Wahhabi imam (cited in the above-mentioned article) had preached that Mother Teresa was destined for eternal punishment in "the middle of hell, deep." Krasniqi's hateful diatribe was based on Mother Teresa's Catholicism and a claim that only Muslims are destined for paradise (a concept specifically denied in the Koran). Krasniqi elaborated on this affront by stating that the Albanian nun "could have all the men she wanted." These declamations were especially scandalous because Mother Teresa is a hero to Albanians of every religion and no religion. The mosque where Krasniqi committed his verbal atrocity is located only two blocks from Mother Teresa Street, the main thoroughfare of the capital, now mainly a pedestrian walkway. The founder of the Missionaries of Charity is viewed by the great majority of Albanians as the embodiment of a principle enunciated by the 19th century Albanian Catholic poet and Ottoman governor of Lebanon, Pashko Vasa, who encouraged his people to "not look to church or mosque/The Albanian's faith is Albanianism." Although Albanians have warred in defense of their nation against Christian Slavs and Muslim Turks, they have never suffered sustained interreligious conflict in their own ranks. Imam Krasniqi's outrageous behavior was condemned by political leaders and Catholic clerics as well as by numerous ordinary Kosovar Muslims contributing to the comment space in the online edition of the daily newspaper Express, which reported the story. Blerim Latifi, adviser to Kosova prime minister Hashim Thaci (the latter having been repeatedly slandered in the West as an alleged Islamist), compared the imam with the Taliban and said, "What this man said about Mother Teresa is a national shame. Only a blind fanatic, who has lost the minimal capacity for reason, speaks in this manner." Fatjon from the northern town of Peja wrote in the Express comment space that he heard the bigoted imam describe all of Europe as "another term for hell." A Prishtina reader with the comment handle "A Muslim who loves his religion" wrote, "Government, react to this if you want a state, otherwise you are leaving the country to be ruled by [the radical imam]." Others cursed and shamed the imam, expressing the wish that he be consumed by Satan; they denounced him as an enemy of Albanians and agent of the Serbs, and advocated his arrest. Vali, from the border town of Gjilan, called the imam a cancer, demanded Krasniqi's expulsion from the official organization of the local Muslim clergy, and concluded with the most dramatic possible statement: "If the Islamic authorities side with Shefqet I will leave Islam." Krasniqi, as is his wont, followed up his outburst with a pompous reaffirmation that the doors of heaven are closed to Mother Teresa. After two days, the official Islamic Community of Kosova formally condemned Krasniqi's remarks, but has failed to remove him from his preaching responsibilities. 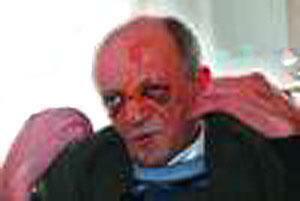 The controversy coincided with another in a series of brutal attacks on anti-extremist Kosovar Muslim functionaries. On February 20, Ejup Krasniqi (no apparent relation), the elderly librarian of the Department of Islamic Studies in Prishtina and Friday preacher in Makovc, a village near the capital, was lured to an isolated location on the pretext of participation in a recitation of prayers for the prophet Muhammad, which is a popular local custom. Wahhabis ban such practices as alleged imitation of Christian devotions to Jesus. The librarian was, according to his own testimony, set upon by a gang of three men, two in masks and one with a hooded sweatshirt. A gun was shoved in his mouth and he was badly beaten, while his assailants shouted that he had violated Islamic practice. The librarian is known as a moderate but otherwise said he had no idea to what the thugs referred. Press photos revealed the extent of the mistreatment inflicted on him. The victim complained that the Kosova police refused to take pictures of his injuries or otherwise show an interest in the incident. As the Wahhabi offensive rolls on across Kosova, many are asking what has emboldened the radicals to such excesses in a place where they were never welcome and seldom seen. Some Albanians fear that the Islamists are counting on the United States to abandon Kosova. But if there is a moral to this tale it is that in Kosova, at least, local Muslims do not need foreign encouragement to defy the extremists.